Egypt was the first country we’d been rather sceptical about visiting. With the ousting of Morsi only a few months previously and violent protests still occurring across Egypt the instability and unpredictability of the situation had made us question whether we should be attempting to drive across. However, from other travellers and local information, we learned that although protests were unpredictable, they were contained to central city areas so easy to avoid and unlike previous ’uprisings’ in Egypt, this time it was very much an internal political battle and tourists were not being targeted. Upon arriving in Egypt our main problem was that that due to the lack of other tourists we got a lot of hassle from local hawkers, desperate to sell you a boat trip, a horse and carriage trip along the Nile or invitations to see a shop filled with random tat, but with the promise that ‘’looking is for free – but I give you very good price if you want to buy something.’’ It was relentless and very trying at times. 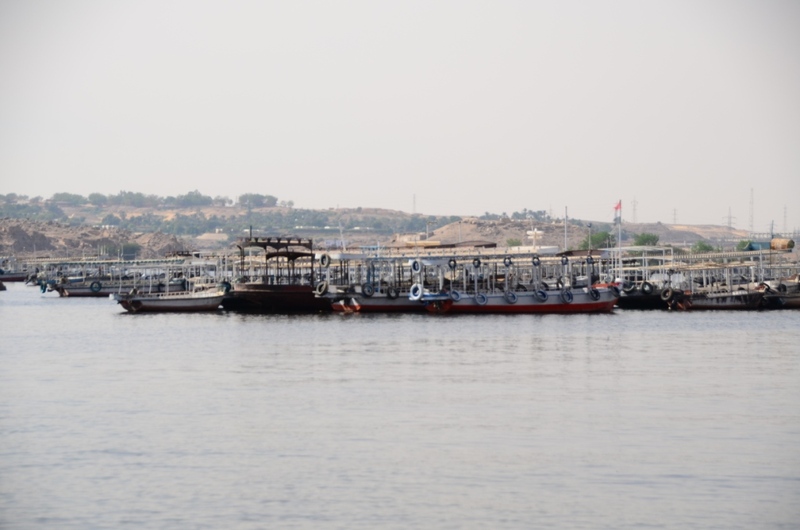 In Aswan, the road along the Nile was lined with forlorn looking malnourished horses and empty carriages and the river banks were filled with empty Feluccas and numerous huge floating Nile cruise hotels with no one aboard. The impact of the ‘Revolution’ on an economy reliant on tourism has been disastrous; the situation all felt very sad. We were welcomed where ever we went, people were so happy to see tourists. We were constantly reassured ‘’Egypt is safe, our problem is with Morsi, no trouble for tourists!’’. However in their desperation to make us feel welcome, take us to nice places, help us spend our money and prove that Egypt was still a great place for tourists, the relentless attention didn’t make for a pleasant or relaxing experience. Combined with the hangover from previous terrorist attacks on tourists during the last 15 years, every tourist area is heavily guarded by armoured vehicles, machine gun wielding soldiers and ‘’special police’’ with handguns wedged down the back of their trousers like something out of Miami Vice. Apparently it’s there just to reassure tourists, but it just made us feel uneasy! So as planned, we took the most direct route across Egypt. Fortunately they have stopped armed escorts along the majority of our route, but we had to pass through numerous, pointless, check points, having to present passports, licences and insurance documents at each one and answer the same question of ‘Where you from’ ‘Where you go’…it was very tedious. We took the new desert road towards Luxor, something which also caused much debate at the beginning check point as to whether tourists were allowed to drive alone on this road. We asked if it was safe and they said yes, so we asked why we couldn’t drive on it – they didn’t know. They then thought they might need some dollars to allow us to pass, but fortunately a senior officer came to our rescue and with a big smile allowed us to pass. 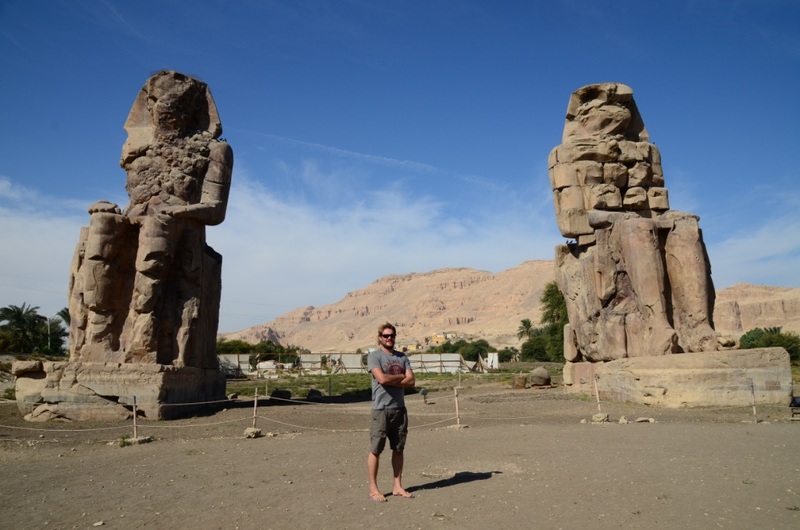 We continued towards Luxor, before turning off towards the Red Sea coastal resorts. 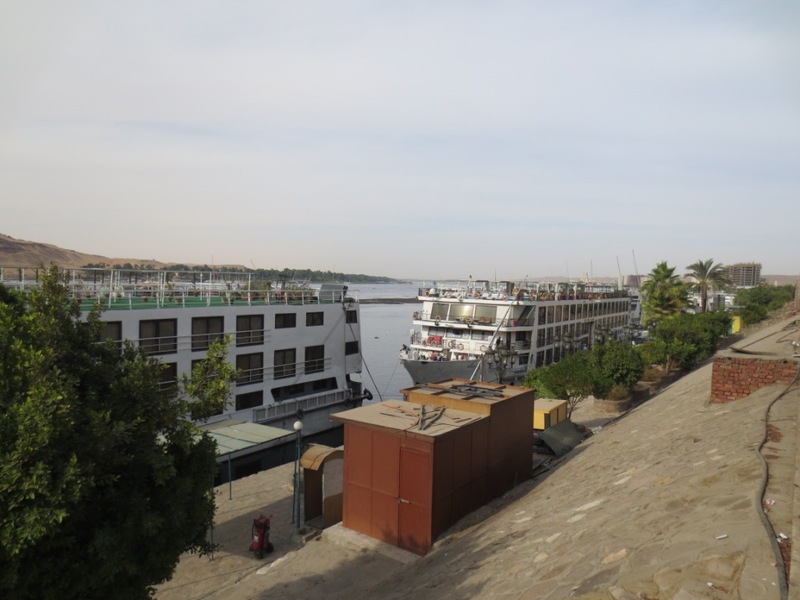 Complete sacrilege, I know, for not staying in Luxor and seeing the incredible sites but we’ll keep that one for our retirement when we are too old to overland and have instead switched to cruising, when we can just float down the Nile, sipping G&Ts and being taken to all the wonderful historical sites under someone else’s steam! 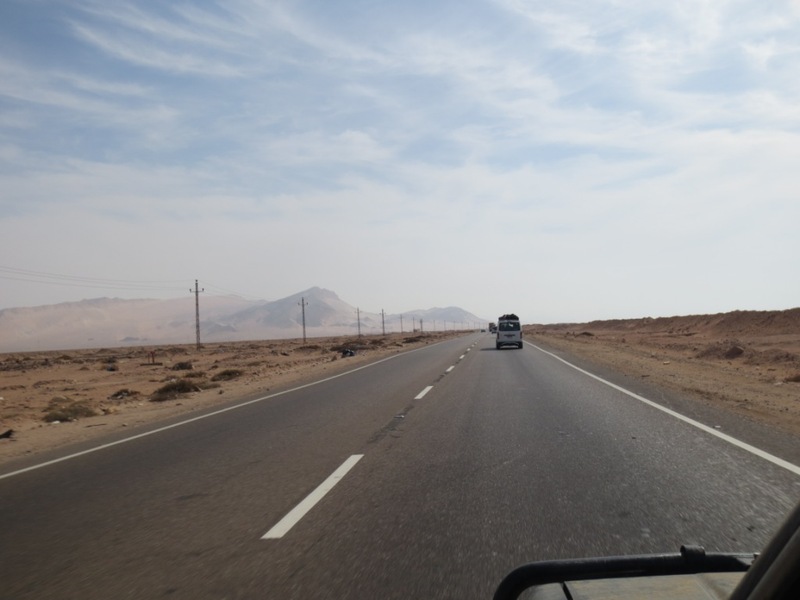 The desert drive lead us to the red-sea resorts on the Egyptian mainland. Vast, monstrous complexes of unfinished, half built tacky resorts that stretch for miles and miles. We were dumbfounded that the demand was ever so high as to require so many hotels and apartments?? To break up the journey we stayed in a couple of these tacky resorts, cheap last minute bookings made for great deals at 5 star hotels, and although splashing out on a nice hotel room was a welcome break from camping, we both struggled to comprehend how people can sit in these resorts for weeks on end – unless you’re a diver – what would you do? Give us wilderness, camping and wildlife any day! We continued on, sticking closely to the coastline and crossing through the Suez tunnel underneath the canal and into the Sinai Peninsula. The Sinai has been a hot bed for unrest and terrorism since time began and although the trend for kidnapping tourists seems to have abated, a recent spate of attacks on soldiers and police, mostly in the North, included a car bomb that had recently been detonated at a checkpoint we’d be travelling through. The adrenalin was pumping as we began the next section of our journey. We passed through the many checkpoints around the Suez with no problem, half expecting someone to tell us we couldn’t pass through into the Sinai but we were waved on without mention of armed convoys or security problems. We began to relax. The road was good, so with cruise control on (yep, it still works!) 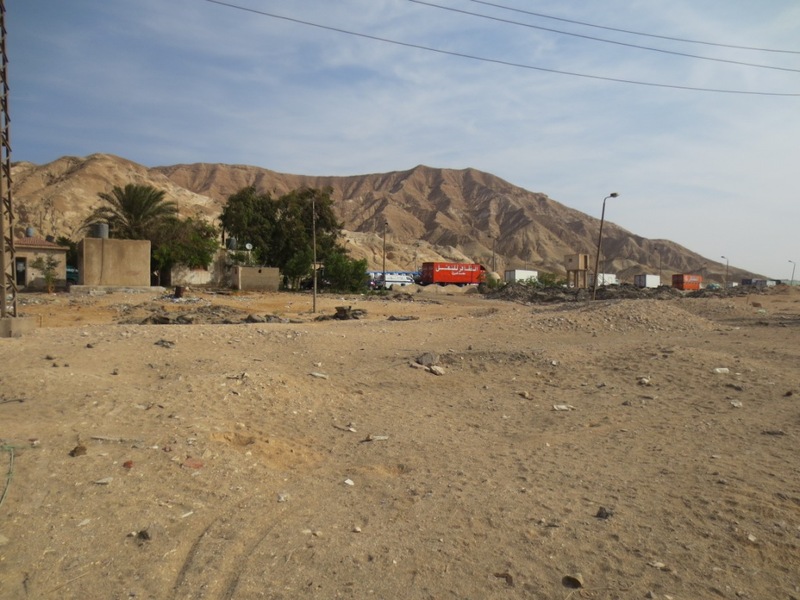 we felt relieved that the journey down the Sinai Peninsula would be over in a few hours. However, about half way down as we slowed down at another police check point we were asked to pull over and wait. They couldn’t speak English and we don’t speak Arabic and not being able to understand what was happening made us agitated; after all, being held at check point was probably the most dangerous place we could be! As we waited, we realised that all passenger vehicles were being held and after an hour, over 50 vehicles had joined the group with armed police heading up the front and chasing the tail of the convoy. We didn’t understand if there was a problem ahead, or where it was dangerous, or where it would end, but suddenly all engines had started and it was go, go, go! The convoy was a farce form the word go. It was like the whacky races as mini buses, lorries and cars flew past us, no one wanted to be at the back! Neither did we! So we sped up and to our surprise Kylie comfortably reached a new record cruising speed of 110km/hr which allowed us to maintain a ‘sheltered’ position within the middle of the pack. 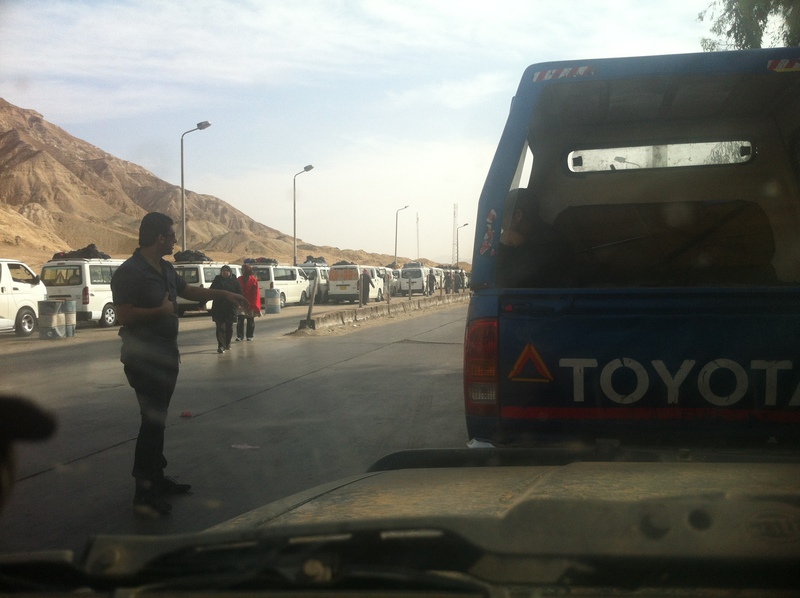 We passed through 2 more checkpoints, each time we were held while the convoy regrouped before being allowed to progress again. It was intense and pretty draining and by the time we reached Sharm El Sheik we were exhausted and certainly not in the mood to be told by police that we couldn’t take a car to our hotel in Naama bay. Tempers flared and the words ‘’I’m a tourist, not a terrorist’’ may have escaped my lips once or twice. But, since the car bomb attacks in 2007, no cars are allowed near the hotels so we had no choice but to park up the car and walk to our hotel for our last night Egypt and our last in Africa. That night we celebrated in the rooftop pool at our hotel, the barman was kept busy all night. We had made it across Africa, in a car that many said wouldn’t make it and this moment was something neither of us had dared to imagine until we were actually there. The cocktail of emotions was immense, elated to have achieved something so huge, relieved to have made it one piece combined with the sadness that the adventure was coming to an end…but we were still a long way from home. 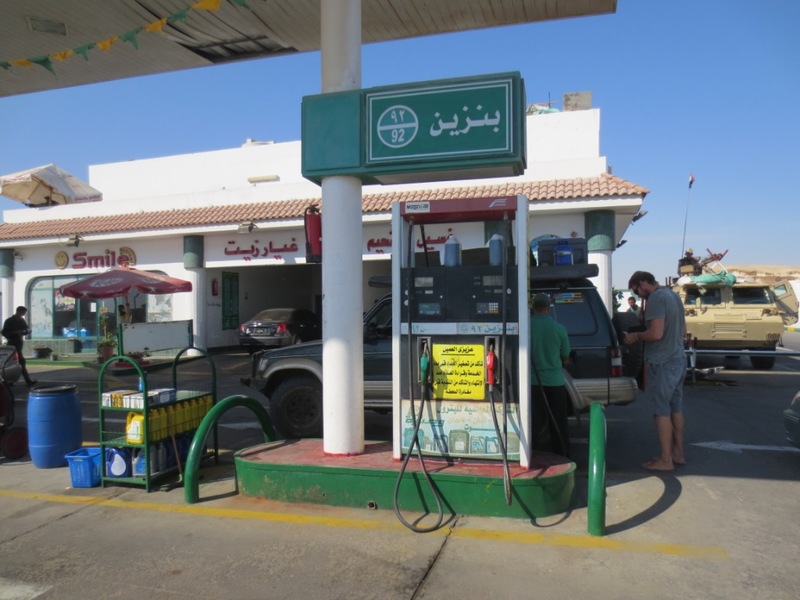 The next morning, with raging hangovers, we drove the remainder of the Sinai Peninsula and headed towards the Israeli border at Taba. In a hazy state we somehow managed to drive straight through a checkpoint, so in dramatic fashion were chased down by police and ordered to go back. As punishment they decided they wanted to search everything in the car, which took over an hour and an half while they pulled everything out, disrespectfully rummaging through our personal items. I took great delight when the officer found my ‘She-wee’, in not telling him what it was until he’d fingered it for long enough trying to work it out. He dropped it like a hot potato when I told him it was a ladies urinating device. He then tried to confiscate our pepper-spray, Leatherman, GPS (which he claimed was a satellite phone) and binoculars(!) which were classed as ‘white weapons’. We declined his offer, took back our things and said thank you to the unpleasant, gum-chewing, ray-ban wearing, did you see my gun in the back of my jeans, self-important police officers, for making us feel so welcome in their country and got on our way. Finally we reached the border, which went surprisingly smoothly on the Egyptian side and we met our first friendly officials since we’d arrived in the country. The customs police wanted to search the entire vehicle once again, but after explaining that this exercise had just been completed 20km down the road, including being searched by sniffer dogs they seemed happy to let us go. Of course, they wanted a bribe for not searching us again, so we cunningly offered them some Israeli Shekels which they were very quick to refuse! 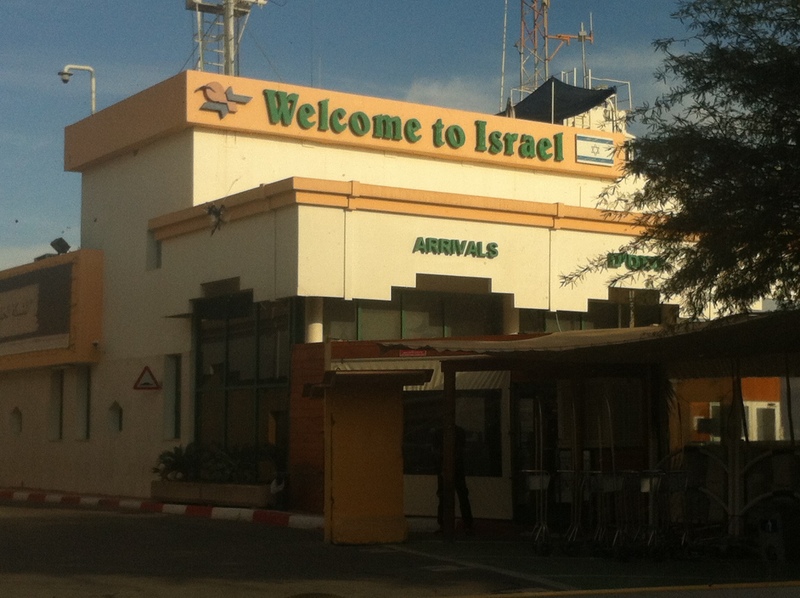 The haphazard approach to security on the Egyptian side was laughable, yet infuriating but things suddenly got a lot more serious as we drove through to Israel, where security levels were beyond anything either of us have ever seen. As we approached we were held between two barriers, while I can only assume checks were being run on the vehicle as we were surveyed at a distance. Above us, manned look out points watched our every move, while casually dressed, athletic men paced around in front of us, talking urgently into their ear-pieces whilst clutching their lightweight hi-tech M16’s. When finally it was deemed we were no threat, the barrier in front of us opened and we were allowed to drive into the central area. We were greeted by an unexpectedly stunning, dark haired, dark eyed, petite woman who walked up to the car to welcome us and talk through the next stages of the procedure. We were going to have to completely strip the car, and send everything through their scanner, before the car would be taken off for a further search, scan and x-ray. Trying to attempt the Israeli border with a hangover was probably not the best idea, but the fact that the officials were so pleasant and apologetic made the whole process much easier, not to mention the fact that everyone was incredibly good looking! 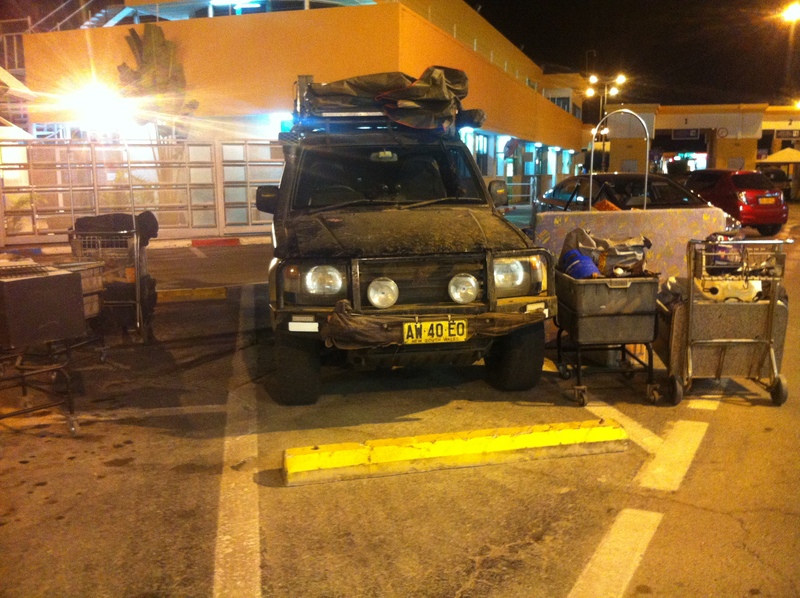 We managed to strip the car and scan everything in fairly good time, but once customs was complete, Immigration wanted to know more about the Sudanese stamps in our passport. They took Richard off for more questioning and a number of questions seemingly related to emails in our account, which they must have been able to access having provided our email address. You could only wonder what information they had on us and how they were able to access it all! By the time the searches were complete, the interview finished and the car put back together, it had taken 7hours! And just like that, we were out of Africa! Gooday, Lyn and Mike from Australia, I for one was not sure if “Kylie” would make it, but well done. Great adventures, we hope that it calms down for you both somewhat and enjoy……Merry Christmas from OZ, stay safe…. I always knew you’d make it. Never lost faith! Wow, how much of an ordeal was that! Still, something to tell the grandkids…!